The Spark hatchback is Chevrolet's smallest and least-expensive car. Starting around $13,000, the Spark undercuts the Fiat 500 and Scion iQ by thousands and offers a reasonably roomy interior. Gasoline versions achieve up to 39 mpg, and an electric model is rated at 82 miles per charge. It can get jittery on the highway, but is at home in the city. I really enjoy the Bluetooth capabilities. The 2015 Chevrolet spark is a really great car. It is a four door vehicle with four seats. The seats in the back are able to be folded to fit items if you are moving or going on a trip. I was able to fit two people, a dog and three days worth of camping supplies in the car. It is compact for those who do not need a lot of space. Because it is so compact, parking is a breeze. If you have issues with parallel parking like I do, this car makes it seem easy. For being a small car, it is not difficult to get it moving. The car has really great gas mileage and when the car is completely on e, it only takes about $20 to fill up for about a week and a half(depending how far you live from work and how often you use your car. ) It has Bluetooth capabilities and satellite radio. It also has cruise control capabilities. The only downside I have about this car is that it does not have a spare tire. It does come with fix a flat. Also, when it is windy, the car does swerve around trying to stay on the road. Overall, this car has been great and it has helped me out a great deal. I would recommend this car. For one person, it is the best! Great on gas, comfortable, fun to drive. I purchased the car used, less than 15,000 miles on it. The one big hassle I've had is for the first 2 or 3 months I had it, it would not start. Had to have roadside assistance either jump start it or tow it into the dealership, as it still had some warranty left on it.. I was annoying to say the least. On top of that I was charge for the service call when they couldn't find out what was wrong with it. Ultimately, it was discovered to be a bad battery. Once that was replaced, I was good to go. The car is good for me, as it's extremely good on gas, has features that I really like. A little noisy inside while driving, but I just turn up the radio. Comfortable for me. Would not be if you had kids or had someone with you all the time. Love the hatchback. 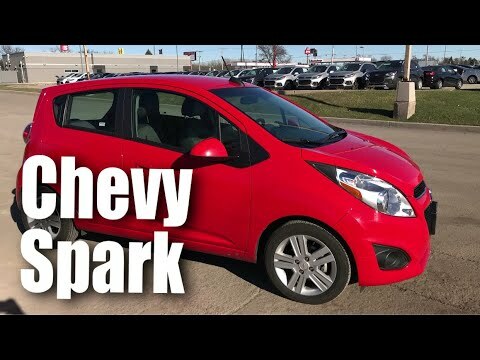 2015 Chevrolet spark 1lt- red. I purchased my 2015 spark in July of 2016, used. It is the perfect car for me as far as handling due to it is size because I was a newer driver and it was my first car. The only issue I have encountered since purchasing is that my shifter cable broke shortly after I got it but, thanks to the awesome people at the dealership I purchased from I had access to OnStar! Had the car towed from my job for free and fixed up in like 2 days tops! Other than that it has been a great experience having it. Not to mention how awesome the gas mileage is!